In the script for his romantic comedy the Merchant of Venice, playwright William Shakespeare recalled the biblical warning that “The Sins of the Father are to be laid upon the children”. 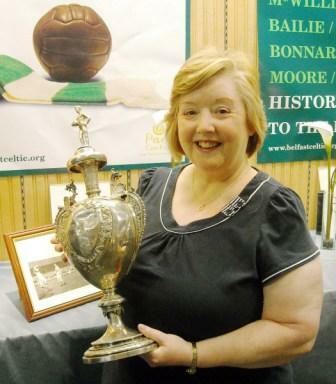 For Linda Mooney, daughter of Belfast Celtic goalkeeper Tommy Breen, a decision her father made long before she was born would be recalled as tragicomedy in a tense dinner date during her formative years, when a dragon stalked the table for its pound of flesh (another phrase coined by the Bard in his famous Italian fable). Captured in her short story Did Your Da Play for Celtic?, the experience was scripted recently for the BBC Radio Ulster My Story series and dragon slayer Linda has given permission to belfastceltic.org to fully re-produce her fiery tale of forlorn love and, of course, football! This was it! Saturday tea to meet his Ma and Da His ma had a fearsome reputation as a girlfriend eater and his Da was a bit of an odd-ball. Walking towards the house I relaxed a little when Jim said that his Da was out so there was only his Ma at home. She didn’t get up when we went in. The room was cold and her face was frigid. We detested each other on sight. Jim did the introductions - she just inclined her head. We sat on the sofa - she was enthroned on the arm chair. Jim talked into the void and I squeaked the odd response. She was monosyllabic. Danny rubbed his forehead. “Ach sure it’s only our Jim’s wee girl and she doesn’t mind, do ye daughter?” I beamed my agreement. The dragon retreated to her lair while Danny regaled us with a replay of the soccer match he’d been to. He was a football fanatic. I’d grown up in a soccer mad household so this was familiar territory and I could see Danny was impressed by my knowledge. Orders from the kitchen summoned us for tea. She attempted to maintain formality but Danny reduced everything to a level of wonderful disorder as he propped his elbows on the table and made sandwiches out of his fry. She embarked on the usual Belfast Inquisition about Street of Birth, Names of Parents, Aunts, Uncles, Who Works Where? His voice was strange. She glared at him, furious at the interruption. Jim developed a great interest in the tablecloth. I met Danny’s gaze and I knew he’d made the connection. My heart soared, I told him and waited for the inevitable follow up. It came. “Did your da play for Celtic?” I nodded - I knew that for a Falls Road man this was like winning the lottery! Then, the guillotine fell.“He betrayed his own when he deserted the green and white for the Linfield red, white and blue – I never forgave him for that!” I felt sick. The ma nudged Danny, put her hand on his arm possessively, smirked – and delivered the deathblow!“ Thank god you remembered Danny, no dacent man would do a thing like that! Our James has had a lucky escape!”I left that house alone!